Needless to say, that everyone should take care of the places they live. Gumball has a bad habit of making a mess in his apartment. Fix everything after this madness and get points. Gumball is having fun with other characters, but you are not in a mood. You want to sit and enjoy your time in silence, but after your friends everything becomes broken. Well, with just a few click you can fix it, but make sure you won't forget about a single thing. Do it and get points for your effort. 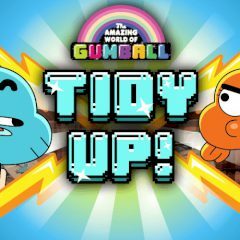 Games Similar Gumball Tidy up!